Pope Benedict XVI will be traveling to Pavia, Italy this weekend -- and Salt + Light has you covered! On Saturday, April 21, we will present to you live Italian coverage. Our coverage begins approximately at 10am ET and runs through 4pm ET. This coverage will include the Holy Father’s arrival to Vigevano, a town in the north-western province of Pavia. There the Holy Father will visit and celebrate Mass at the Piazza Ducale. 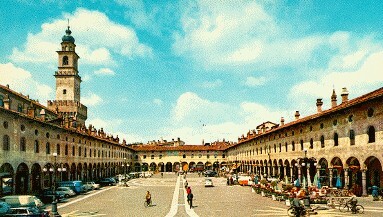 Pope Benedict will then travel to Pavia, the capital city of the Pavia province. He will be welcomed at the Piazza Duomo di Pavia. Again, all coverage on Saturday will be in Italian. On Sunday, April 22nd, Salt + Light will present to you live English coverage of the Holy Mass from Orti dell’Almo Collegio Borromeo, the Gardens of Borromeo College in Pavia. His Holiness, Pope Benedict XVI will preside. This Mass will be broadcast at 4:30am ET and will repeat again at 3:30pm ET. French translation will be available for the Mass on the second audio program. Further live Italian coverage will begin on Sunday at 9:30am ET. This coverage will include the Pope’s visit to one of the oldest universities in Europe, the University of Pavia. That will be followed by coverage of the Holy Father's visit to the basilica of San Pietro in Ciel d'Oro. It is here that the relics of St. Augustine are kept! St. Augustine has been a great influence to Pope Benedict: his doctorate in theology is on Augustine, and he has regularly expressed the influence this great Church Doctor has had on his life and thought. The live Italian coverage will conclude around 2pm ET, with a closing ceremony from Pavia. Enjoy following the travels of our Holy Father, exclusively on Salt + Light!